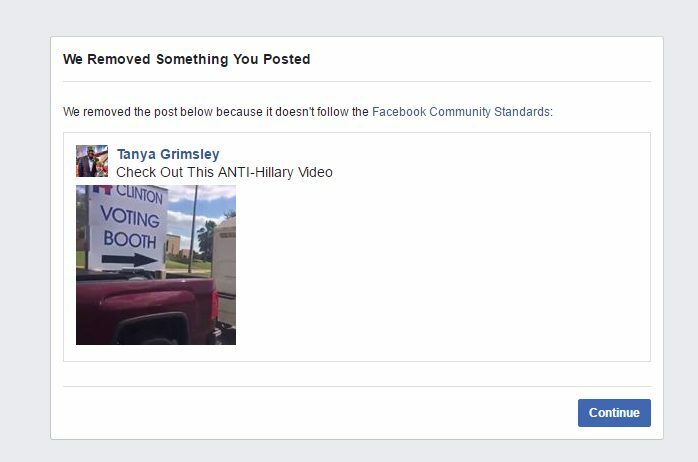 On Tuesday, Election Day of all days, Tanya Grimsley, an administrator of more than 40 Facebook pages, including the popular Allen West Republic page, said she received a 30-day ban over a short anti-Hillary Clinton video. The video, she said, was posted to all of her pages, but was only yanked from one page, Obama Makes Me Puke, a page liked by over 209,000 users. “This page,” she further explained, “is routinely targeted by Facebook for some reason.” We looked at the page and found nothing that violates Facebook’s “standards,” but that’s nothing new. Pages are often torn down and administrators punished for things that come nowhere close to violating the site’s nebulous standards, which seem to change with the mood of the moderator. The short video, which can be seen below, is still live here — at least for the time being. One has to ask: Why is this post okay for more than 20 other pages, but not one? It’s a good question that deserves a good answer. Facebook spokespeople and executives routinely tell us that ideology has nothing to do with the decisions made by their moderators. But as I’ve documented numerous times over the last five years, both here and at the now-defunct Examiner.com, that excuse simply doesn’t hold water. Time and again, moderators punish users and block innocuous content even as the company claims it doesn’t happen. And unless one is well-known, well-connected, or knows someone who knows someone at the social media site, nothing gets done. In short, the virtual “Jedi Mind Trick” just doesn’t work anymore. They can tell us “these aren’t the droids you’re looking for,” but users just aren’t buying it. And as Adina Kutnicki, an investigative journalist based in Israel, and I note in our book, “Banned: How Facebook enables militant Islamic jihad,” available at Amazon and the WND Superstore, the censorship has nothing to do with Facebook being a private company, as many believe. It has everything to do with federal law. Section 230 of the 20-year-old Communications Decency Act has been interpreted by a federal judge to mean that social media sites can censor even Constitutionally-protected speech with zero legal consequences. That means the only real remedy lies with Congress. And since members of Congress from both parties receive thousands of dollars from Facebook in campaign contributions, issues like this will get put on the back burner. Meanwhile, the beatings will continue and Facebook will continue to tell us that things like this don’t happen. Even as they’re actually happening. Previous articlePodestas: Satanists and Pedos – Are the Accusations True? Next articleOPINION: If Trump Edges Clinton, Will Hillary Go Gracefully?